When you talk crime statistics with an establishment type in the UK, they always try to make things out to be better than they are. These days they have a very hard task. Crime in the UK is exploding at an alarming rate. According to recently released statistics, it's the most violent place in the European Union. And those who parry that "it's not as bad as the U.S." -- as so many do when talking crime statistics -- are correct. The UK is worse. 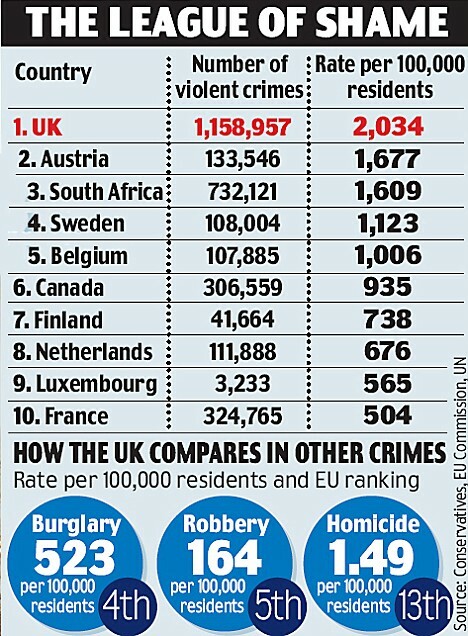 In the UK, there are 2,034 offenses per 100,000 people, way ahead of second-place Austria at 1,677. The U.S. has a rate of 466 crimes per 100,000 residents, Canada has 935, Australia has 92, and South Africa has 1,609. Yes -- the UK has a larger problem with violent crime than South Africa. Violent crime in England and Wales has fallen by almost a half a peak in 1995 but we are not complacent and know there is still work to do. That is why last year we published "Saving lives. Reducing harm. Protecting the public. An Action Plan for Tackling Violence 2008-11." Much of this violence is racial and ethnic in nature. Violence against Jews reached a record 114 incidents in 2007, the highest number since records were begun in 1984. This is a country that has completely disarmed its populace and enacted severe penalties for those engaging in self-defense. Victims who fight back are as likely to end up in court as those that attacked them. Despite increased home invasion crime, Tony Blair ruled out legislation to aide the homeowner. Around ten minutes later he came back down. He said, "There's more piggies aren't there?" and that it was my fault this was happening. I said there wasn't any more, then he said "Which one do you want to see die first?"